Let’s start off where it all pretty much began: the summer of 1946. In May of that year, two separate motorists in southern Sweden reported to police there that they had seen a long rocket- or zeppelin-like object in the skies overhead. They could not agree on whether the object had wings or not, but one witness claimed to have tracked the object with his family for some five minutes. 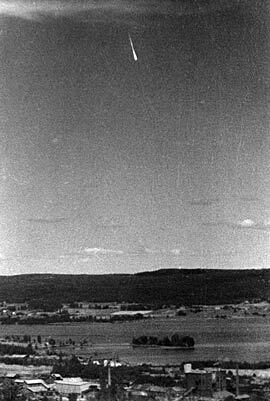 Subsequent sightings of shooting stars drew the attention of local journalists, who were told by some witnesses that they were reminiscent of the kinds of “flying bombs” they had seen during World War II (here they were referring to a number of V-1 and V-2 rockets launched from Nazi Germany that had landed on Swedish territory). At first, the media referred to the objects as “rocket bombs,” but then in late May the Swedish newspaper Aftonbladet dubbed them “ghost rockets” and the name has stuck ever since. During the summer of 1946, Swedish Defense Staff registered at least a thousand reports of ghost rocket sightings, with likely many more going unreported. While there was a relatively steady stream of reports coming in, a flurry of sightings were made on 9th and 10th of June, helping to spark a great deal of concern within both the Swedish general public and the British and American military intelligence communities. 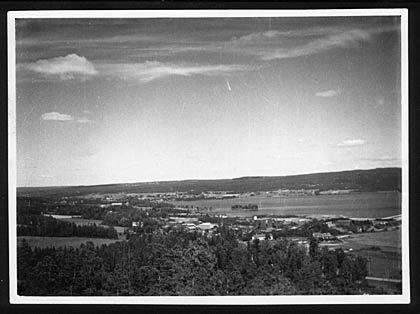 It was at this time that a photograph (see the one above) was taken by a Swedish man by the name of Erik Reuterswärd, who was on vacation with his wife at Guldsmedshyttan in the southern part of the country. Reuterswärd was snapping photos when he and his wife caught site of a daytime meteor. He took some more pictures, and it was only on getting his film developed that he found he had successfully captured the meteor on film. Media outlets in Sweden and abroad eventually used Reuterswärd’s photo in publicizing news about ghost rockets sightings. These outlets, however, generally cropped his photo (see below) and dubbed it an image of an actual ghost rocket. It is an interesting example, then, of the ways in which the mass media has played a decisive in shaping public perceptions of unidentified flying objects. For the full story on Erik Reuterswärd and his famous photograph, see this interesting piece by Swedish journalist and ufologist Clas Svahn. Svahn remains one of the leading experts on the history of the ghost rocket scare. He and several colleagues have recently released a documentary film on the ghost rocket phenomenon. You can see a trailer and more information about the film here.